Janhavi Acharekar is the author of the novel Wanderers, All (HarperCollins, 2015), a collection of short stories Window Seat: Rush-Hour Stories from the City (HarperCollins, 2009), and the travel guide Moon Mumbai & Goa (Avalon, 2009) - the first Indian destination guide by the American travel book series, Moon Handbooks. 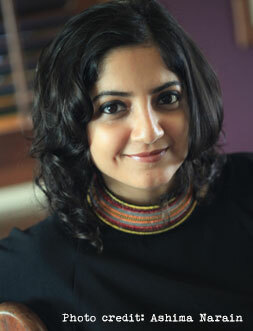 Her writings feature in various short-fiction anthologies including the Indo-Australian Fear Factor: Terror Incognito (Picador, 2009 and Pan Macmillan, 2010) and Only Connect: Short Fiction about Technology and Us from Australia and the Indian Subcontinent (Brass Monkey Books and Rupa, 2014). Her features on travel, books and the arts have appeared in leading Indian and international publications including The Hindu, The Times of India, Vancouver Sun, among others. She is a contributing editor at Conde Nast Traveller India. Janhavi was declared one of nine Mumbaikars of the Year (2009) by Asian Age for Window Seat while Moon Mumbai & Goa was a finalist in the Travel Guide category at Foreword Magazine's Book of the Year Awards (BOTYA, USA) 2009. She was awarded the Charles Wallace Visiting Writer's Fellowship at the University of Stirling, Scotland (2009), followed by writing residencies at Sangam House in Pondicherry, H.A.L.D. in Denmark, and at the International Writers' and Translators' House in Ventspils, Latvia. An occasional curator of literary festivals, she has curated/ co-curated the Kala Ghoda, Crossword and Celebrate Bandra litfests in Mumbai. She was the founder-curator of Lit.mus, a multi-disciplinary litfest in Bangalore.